The history of Cambodia, a country in mainland Southeast Asia, can be traced back to at least the 5th millennium BCE. Detailed records of a political structure on the territory of what is now Cambodia first appear in Chinese annals in reference to Funan, a polity that encompassed the southernmost part of the Indochinese peninsula during the 1st to 6th centuries. Centered at the lower Mekong, Funan is noted as the oldest regional Hindu culture, which suggests prolonged socio-economic interaction with maritime trading partners of the Indosphere in the west. By the 6th century a civilisation, called Chenla or Zhenla in Chinese annals, firmly replaced Funan, as it controlled larger, more undulating areas of Indochina and maintained more than a singular centre of power. The Khmer Empire was established by the early 9th century. Sources refer here to a mythical initiation and consecration ceremony to claim political legitimacy by founder Jayavarman II at Mount Kulen (Mount Mahendra) in 802 CE. A succession of powerful sovereigns, continuing the Hindu devaraja cult tradition, reigned over the classical era of Khmer civilization until the 11th century. A new dynasty of provincial origin introduced Buddhism, which according to some scholars resulted in royal religious discontinuities and general decline. The royal chronology ends in the 14th century. Great achievements in administration, agriculture, architecture, hydrology, logistics, urban planning and the arts are testimony to a creative and progressive civilisation - in its complexity a cornerstone of Southeast Asian cultural legacy. The decline continued through a transitional period of approximately 100 years followed by the Middle Period of Cambodian history, also called the Dark ages of Cambodia, beginning in the mid 15th century. Although the Hindu cults had by then been all but replaced, the monument sites at the old capital remained an important spiritual centre. Yet since the mid 15th century the core population steadily moved to the east and – with brief exceptions – settled at the confluence of the Mekong and Tonle Sap rivers at Chaktomuk, Longvek and Oudong. Maritime trade was the basis for a very prosperous 16th century. But, as a result foreigners – Muslim Malays and Cham, Christian European adventurers and missionaries – increasingly disturbed and influenced government affairs. Ambiguous fortunes, a robust economy on the one hand and a disturbed culture and compromised royalty on the other were constant features of the Longvek era. By the 15th century, the Khmers' traditional neighbours, the Mon people in the west and the Cham people in the east had gradually been pushed aside or replaced by the resilient Siamese/Thai and Annamese/Vietnamese, respectively. These powers had perceived, understood and increasingly followed the imperative of controlling the lower Mekong basin as the key to control all Indochina. A weak Khmer kingdom only encouraged the strategists in Ayutthaya (later in Bangkok) and in Huế. Attacks on and conquests of Khmer royal residences left sovereigns without a ceremonial and legitimate power base. Interference in succession and marriage policies added to the decay of royal prestige. Oudong was established in 1601 as the last royal residence of the Middle Period. The 19th-century arrival of then technologically more advanced and ambitious European colonial powers with concrete policies of global control put an end to regional feuds and as Siam/Thailand, although humiliated and on the retreat, escaped colonisation as a buffer state, Vietnam was to be the focal point of French colonial ambition. Cambodia, although largely neglected, had entered the Indochinese Union as a perceived entity and was capable to carry and reclaim its identity and integrity into modernity. After 80 years of colonial hibernation, the brief episode of Japanese occupation during World War II, that coincided with the investiture of king Sihanouk was the opening act for the irreversible process towards re-emancipation and modern Cambodian history. The Kingdom of Cambodia (1953–70), independent since 1953, struggled to remain neutral in a world shaped by polarisation of the nuclear powers USA and Soviet Union. As the Indochinese war escalates, Cambodia becomes increasingly involved, the Khmer Republic is one of the results in 1970, another is civil war. 1975, abandoned and in the hands of the Khmer Rouge, Cambodia endures its darkest hour – Democratic Kampuchea and its long aftermath of Vietnamese occupation, the People's Republic of Kampuchea and the UN Mandate towards Modern Cambodia since 1993. Radiocarbon dating of a cave at Laang Spean in Battambang Province, northwest Cambodia confirmed the presence of Hoabinhian stone tools from 6000–7000 BCE and pottery from 4200 BCE. Starting in 2009 archaeological research of the Franco-Cambodian Prehistoric Mission has documented a complete cultural sequence from 71.000 years BP to the Neolithic period in the cave. Finds since 2012 lead to the common interpretation, that the cave contains the archaeological remains of a first occupation by hunter and gatherer groups, followed by Neolithic people with highly developed hunting strategies and stone tool making techniques, as well as highly artistic pottery making and design, and with elaborate social, cultural, symbolic and exequial practices. Skulls and human bones found at Samrong Sen in Kampong Chhnang Province date from 1500 BCE. Heng Sophady (2007) has drawn comparisons between Samrong Sen and the circular earthwork sites of eastern Cambodia. These people may have migrated from South-eastern China to the Indochinese Peninsula. Scholars trace the first cultivation of rice and the first bronze making in Southeast Asia to these people. 2010 Examination of skeletal material from graves at Phum Snay in north-west Cambodia revealed an exceptionally high number of injuries, especially to the head, likely to have been caused by interpersonal violence. The graves also contain a quantity of swords and other offensive weapons used in conflict. The Iron Age period of Southeast Asia begins around 500 BCE and lasts until the end of the Funan era - around 500 A.D. as it provides the first concrete evidence for sustained maritime trade and socio-political interaction with India and South Asia. By the 1st century settlers have developed complex, organised societies and a varied religious cosmology, that required advanced spoken languages very much related to those of the present day. The most advanced groups lived along the coast and in the lower Mekong River valley and the delta regions in houses on stilts where they cultivated rice, fished and kept domesticated animals. Map of Funan at around the 3rd century. Chinese annals contain detailed records of the first known organised polity, the Kingdom of Funan, on Cambodian and Vietnamese territory characterised by "high population and urban centers, the production of surplus food...socio-political stratification [and] legitimized by Indian religious ideologies". Centered around the lower Mekong and Bassac rivers from the first to sixth century CE with "walled and moated cities" such as Angkor Borei in Takeo Province and Óc Eo in modern An Giang Province, Vietnam. Early Funan was composed of loose communities, each with its own ruler, linked by a common culture and a shared economy of rice farming people in the hinterland and traders in the coastal towns, who were economically interdependent, as surplus rice production found its way to the ports. By the second century CE Funan controlled the strategic coastline of Indochina and the maritime trade routes. Cultural and religious ideas reached Funan via the Indian Ocean trade route. Trade with India had commenced well before 500 BCE as Sanskrit hadn't yet replaced Pali. Funan's language has been determined as to have been an early form of Khmer and its written form was Sanskrit. In the period 245–250 CE dignitaries of the Chinese Kingdom of Wu visited the Funan city Vyadharapura. Envoys Kang Tai and Zhu Ying defined Funan as to be a distinct Hindu culture. Trade with China had begun after the southward expansion of the Han Dynasty, around the 2nd century BCE Effectively Funan "controlled strategic land routes in addition to coastal areas" and occupied a prominent position as an "economic and administrative hub" between The Indian Ocean trade network and China, collectively known as the Maritime Silk Road. Trade routes, that eventually ended in distant Rome are corroborated by Roman and Persian coins and artefacts, unearthed at archaeological sites of 2nd and 3rd century settlements. Funan is associated with myths, such as the Kattigara legend and the Khmer founding legend in which an Indian Brahman or prince named Preah Thaong in Khmer, Kaundinya in Sanskrit and Hun-t’ien in Chinese records marries the local ruler, a princess named Nagi Soma (Lieu-Ye in Chinese records), thus establishing the first Cambodian royal dynasty. Scholars debate as to how deep the narrative is rooted in actual events and on Kaundinya's origin and status. A Chinese document, that underwent 4 alterations and a 3rd-century epigraphic inscription of Champa are the contemporary sources. Some scholars consider the story to be simply an allegory for the diffusion of Indic Hindu and Buddhist beliefs into ancient local cosmology and culture whereas some historians dismiss it chronologically. 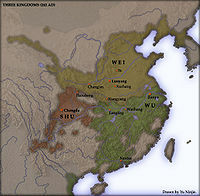 Chinese annals report that Funan reached its territorial climax in the early 3rd century under the rule of king Fan Shih-man, extending as far south as Malaysia and as far west as Burma. A system of mercantilism in commercial monopolies was established. Exports ranged from forest products to precious metals and commodities such as gold, elephants, ivory, rhinoceros horn, kingfisher feathers, wild spices like cardamom, lacquer, hides and aromatic wood. Under Fan Shih-man Funan maintained a formidable fleet and was administered by an advanced bureaucracy, based on a "tribute-based economy, that produced a surplus which was used to support foreign traders along its coasts and ostensibly to launch expansionist missions to the west and south". Historians maintain contradicting ideas about Funan's political status and integrity. Miriam T. Stark calls it simply Funan: [The]"notion of Fu Nan as an early "state"...has been built largely by historians using documentary and historical evidence" and Michael Vickery remarks: "Nevertheless, it is...unlikely that the several ports constituted a unified state, much less an 'empire'". Other sources though, imply imperial status: "Vassal kingdoms spread to southern Vietnam in the east and to the Malay peninsula in the west" and "Here we will look at two empires of this period...Funan and Srivijaya". "As Funan was indeed in decline caused by shifts in Southeast Asian maritime trade routes, rulers had to seek new sources of wealth inland." "By the end of the fifth century, international trade through southeast Asia was almost entirely directed through the Strait of Malacca. Funan, from the point of view of this trade, had outlived its usefulness." The archaeological approach to and interpretation of the entire early historic period is considered to be a decisive supplement for future research. The "Lower Mekong Archaeological Project" focuses on the development of political complexity in this region during the early historic period. LOMAP survey results of 2003 to 2005, for example, have helped to determine that "...the region’s importance continued unabated throughout the pre-Angkorian period...and that at least three [surveyed areas] bear Angkorian-period dates and suggest the continued importance of the delta." Chenla-era statue of Buddha found at Binh Hoa, Long An. The History of the Chinese Sui dynasty contains records that a state called Chenla sent an embassy to China in 616 or 617 CE It says, that Chenla was a vassal of Funan, but under its ruler Citrasena-Mahendravarman conquered Funan and gained independence. Most of the Chinese recordings on Chenla, including that of Chenla conquering Funan, have been contested since the 1970s as they are generally based on single remarks in the Chinese annals, as author Claude Jacques emphasised the very vague character of the Chinese terms 'Funan' and 'Chenla', while more domestic epigraphic sources become available. Claude Jacques summarises: "Very basic historical mistakes have been made" because "the history of pre-Angkorean Cambodia was reconstructed much more on the basis of Chinese records than on that of [Cambodian] inscriptions" and as new inscriptions were discovered, researchers "preferred to adjust the newly discovered facts to the initial outline rather than to call the Chinese reports into question". The notion of Chenla's centre being in modern Laos has also been contested. "All that is required is that it be inland from Funan." The most important political record of pre-Angkor Cambodia, the inscription K53 from Ba Phnom, dated 667 CE does not indicate any political discontinuity, either in royal succession of kings Rudravarman, Bhavavarman I, Mahendravarman [Citrasena], Īśānavarman, and Jayavarman I or in the status of the family of officials who produced the inscription. Another inscription of a few years later, K44, 674 CE, commemorating a foundation in Kampot province under the patronage of Jayavarman I, refers to an earlier foundation in the time of King Raudravarma, presumably Rudravarman of Funan, and again there is no suggestion of political discontinuity. The History of the T'ang asserts that shortly after 706 the country was split into Land Chenla and Water Chenla. The names signify a northern and a southern half, which may conveniently be referred to as Upper and Lower Chenla. Ancient Chinese records mention two kings, Shrutavarman and Shreshthavarman who ruled at the capital Shreshthapura located in modern-day southern Laos. The immense influence on the identity of Cambodia to come was wrought by the Khmer Kingdom of Bhavapura, in the modern day Cambodian city of Kampong Thom. Its legacy was its most important sovereign, Ishanavarman who completely conquered the kingdom of Funan during 612–628. He chose his new capital at the Sambor Prei Kuk, naming it Ishanapura. Map of South-east Asia c. 900 CE, showing the Khmer Empire in red, Champa in yellow and Haripunjaya in light Green plus additional surrounding states. The six centuries of the Khmer Empire are characterised by unparalleled technical and artistic progress and achievements, political integrity and administrative stability. The empire represents the cultural and technical apogee of the Cambodian and Southeast Asian pre-industrial civilisation. The Khmer Empire was preceded by Chenla, a polity with shifting centres of power, which was split into Land Chenla and Water Chenla in the early 8th century. By the late 8th century Water Chenla was absorbed by the Malays of the Srivijaya Empire and the Javanese of the Shailandra Empire and eventually incorporated into Java and Srivijaya. Jayavarman II, ruler of Land Chenla, initiates a mythical Hindu consecration ceremony at Mount Kulen (Mount Mahendra) in 802 CE, intended to proclaim political autonomy and royal legitimacy. As he declared himself devaraja - god-king, divinely appointed and uncontested, he simultaneously declares independence from Shailandra and Srivijaya. He established Hariharalaya, the first capital of the Angkorean area near the modern town of Roluos. Jayavarman II's successors continued to reside north of the Tonlé Sap lake. This population centre was subject to extensive urban planning, embedded in an elaborate hydraulic network of water reservoirs and canals around central monumental religious structures. The religious monuments underwent over the course of several centuries a sophisticated architectural, stylistic and aesthetic development of eventually most exquisite expression and mastery of composition. Bakong, one of the earliest temple mountain in Khmer architecture. Indravarman I (877–889) and his son and successor Yasovarman I (889–900), who established the capital Yasodharapura ordered the construction of huge water reservoirs (barays) north of the capital. The water management network depended on elaborate configurations of channels, ponds, and embankments built from huge quantities of clayey sand, the available bulk material on the Angkor plain. Dikes of the East Baray still exist today, which are more than 7 km (4 mi) long and 1.8 km (1 mi) wide. The largest component is the West Baray, a reservoir about 8 km (5 mi) long and 2 km (1 mi) across, containing approximately 50 million m3 of water. Royal administration was based on the religious idea of the Shivaite Hindu state and the central cult of the sovereign as warlord and protector – the "Varman". This centralised system of governance appointed royal functionaries to provinces. The Mahidharapura dynasty – its first king was Jayavarman VI (1080 to 1107), which originated west of the Dângrêk Mountains in the Mun river valley discontinued the old "ritual policy", genealogical traditions and crucially, Hinduism as exclusive state religion. Some historians relate the empires' decline to these religious discontinuities. The area that comprises the various capitals was spread out over around 1,000 km2 (386 sq mi), it is nowadays commonly called Angkor. The combination of sophisticated wet-rice agriculture, based on an engineered irrigation system and the Tonlé Sap's spectacular abundance in fish and aquatic fauna, as protein source guaranteed a regular food surplus. Recent Geo-surveys have confirmed that Angkor maintained the largest pre-industrial settlement complex worldwide during the 12th and 13th centuries – some three quarters of a million people lived there. Sizeable contingents of the public workforce were to be redirected to monument building and infrastructure maintenance. A growing number of researchers relates the progressive over-exploitation of the delicate local eco-system and its resources alongside large scale deforestation and resulting erosion to the empires' eventual decline. Under king Suryavarman II (1113–1150) the empire reached its greatest geographic extent as it directly or indirectly controlled Indochina, the Gulf of Thailand and large areas of northern maritime Southeast Asia. Suryavarman II commissioned the temple of Angkor Wat, built in a period of 37 years, its five towers representing Mount Meru is considered to be the most accomplished expression of classical Khmer architecture. However, territorial expansion ended when Suryavarman II was killed in battle attempting to invade Đại Việt. It followed a period of dynastic upheaval and a Cham invasion that culminated in the sack of Angkor in 1177. Portrait statue of Jayavarman VII. King Jayavarman VII (reigned 1181–1219) is generally considered to be Cambodia's greatest King. A Mahayana Buddhist, he initiates his reign by striking back against Champa in a successful campaign. During his nearly forty years in power he becomes the most prolific monument builder, who establishes the city of Angkor Thom with its central temple the Bayon. Further outstanding works are attributed to him – Banteay Kdei, Ta Prohm, Neak Pean and Sra Srang. The construction of an impressive number of utilitarian and secular projects and edifices, such as maintenance of the extensive road network of Suryavarman I, in particular the royal road to Phimai and the many rest houses, bridges and hospitals make Jayavarman VII unique among all imperial rulers. In August 1296, the Chinese diplomat Zhou Daguan arrived at Angkor and remained at the court of king Srindravarman until July 1297. He wrote a detailed report, The Customs of Cambodia, on life in Angkor. His portrayal is one of the most important sources of understanding historical Angkor as the text offers valuable information on the everyday life and the habits of the inhabitants of Angkor. The last Sanskrit inscription is dated 1327, and records the succession of Indrajayavarman by Jayavarman IX Parameshwara (1327–1336). The empire was an agrarian state that consisted essentially of three social classes, the elite, workers and slaves. The elite included advisers, military leaders, courtiers, priests, religious ascetics and officials. Workers included agricultural labourers and also a variety of craftsman for construction projects. Slaves were often captives from military campaigns or distant villages. Coinage did not exist and the barter economy was based on agricultural produce, principally rice, with regional trade as an insignificant part of the economy. The term "Dark ages of Cambodia", also the "Middle Period" refers to the historical era from the early 15th century to 1863, the beginning of the French Protectorate of Cambodia. Reliable sources – particularly for the 15th and 16th century – are very rare. A conclusive explanation that relates to concrete events manifesting the decline of the Khmer Empire has not yet been produced. However, most modern historians consent that several distinct and gradual changes of religious, dynastic, administrative and military nature, environmental problems and ecological imbalance coincided with shifts of power in Indochina and must all be taken into account to make an interpretation. In recent years, focus has notably shifted towards studies on climate changes, human–environment interactions and the ecological consequences. Epigraphy in temples, ends in the third decade of the fourteenth, and does not resume until the mid-16th century. 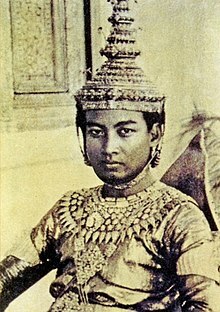 Recording of the Royal Chronology discontinues with King Jayavarman IX Parameshwara (or Jayavarma-Paramesvara) – there exists not a single contemporary record of even a king’s name for over 200 years. Construction of monumental temple architecture had come to a standstill after Jayavarman VIIth reign. According to author Michael Vickery there only exist external sources for Cambodia’s 15th century, the Chinese Ming Shilu annals and the earliest Royal Chronicle of Ayutthaya. Wang Shi-zhen (王世貞), a Chinese scholar of the 16th century, remarked: "The official historians are unrestrained and are skilful at concealing the truth; but the memorials and statutes they record and the documents they copy cannot be discarded." The central reference point for the entire 15th century is a Siamese intervention of some undisclosed nature at the capital Yasodharapura (Angkor Thom) around the year 1431. Historians relate the event to the shift of Cambodia's political centre southward to the region of Phnom Penh, Longvek and later Oudong. "As Siam became Cambodia’s primary nemesis after the demise of Angkor, it put an end to the pattern of ambivalent sovereignty that Cambodia’s imperial experiment on its western frontier had so effectively prolonged." Sources for the 16th century are more numerous. The kingdom is centred at the Mekong, prospering as an integral part of the Asian maritime trade network, via which the first contact with European explorers and adventurers does occur. Wars with the Siamese result in loss of territory and eventually the conquest of the capital Longvek in 1594. The Vietnamese on their "Southward March" reach Prei Nokor/Saigon at the Mekong Delta in the 17th century. This event initiates the slow process of Cambodia losing access to the seas and independent marine trade. Siamese and Vietnamese dominance intensified during the 17th and 18th century, resulting in frequent displacements of the seat of power as the Khmer royal authority decreased to the state of a vassal. In the early 19th century with dynasties in Vietnam and Siam firmly established, Cambodia was placed under joint suzerainty, having lost its national sovereignty. British agent John Crawfurd states: "...the King of that ancient Kingdom is ready to throw himself under the protection of any European nation..." To save Cambodia from being incorporated into Vietnam and Siam, King Ang Duong agreed to colonial France's offers of protection, which took effect with King Norodom Prohmbarirak signing and officially recognising the French protectorate on 11 August 1863. In August 1863 King Norodom signed an agreement with the French placing the kingdom under the protection of France. The original treaty left Cambodian sovereignty intact, but French control gradually increased, with important landmarks in 1877, 1884, and 1897, until by the end of the century the king's authority no longer existed outside the palace. Norodom died in 1904, and his two successors, Sisowath and Monivong, were content to allow the French to control the country, but in 1940 France was defeated in a brief border war with Thailand and forced to surrender the provinces of Battambang and Angkor (the ancient site of Angkor itself was retained). King Monivong died in April 1941 and the French placed the obscure Prince Sihanouk on the throne as king, believing that the inexperienced 18-year old would be more pliable than Monivong's middle-aged son, Prince Monireth. On 9 March 1945, during the Japanese occupation of Cambodia, young king Norodom Sihanouk proclaimed an independent Kingdom of Kampuchea, following a formal request by the Japanese. Shortly thereafter the Japanese government nominally ratified the independence of Cambodia and established a consulate in Phnom Penh. The new government did away with the romanisation of the Khmer language that the French colonial administration was beginning to enforce and officially reinstated the Khmer script. This measure taken by the short-lived governmental authority would be popular and long-lasting, for since then no government in Cambodia has tried to romanise the Khmer language again. After Allied military units entered Cambodia, the Japanese military forces present in the country were disarmed and repatriated. The French were able to reimpose the colonial administration in Phnom Penh in October the same year. Cornation of Norodom Sihanouk in 1941. Neutrality was the central element of Cambodian foreign policy during the 1950s and 1960s. By the mid-1960s, parts of Cambodia's eastern provinces were serving as bases for North Vietnamese Army and National Liberation Front (NVA/NLF) forces operating against South Vietnam, and the port of Sihanoukville was being used to supply them. As NVA/VC activity grew, the United States and South Vietnam became concerned, and in 1969, the United States began a 14-month-long series of bombing raids targeted at NVA/VC elements, contributing to destabilisation. The bombing campaign took place no further than ten, and later twenty miles (32 km) inside the Cambodian border, areas where the Cambodian population had been evicted by the NVA. Prince Sihanouk, fearing that the conflict between communist North Vietnam and South Vietnam might spill over to Cambodia, publicly opposed the idea of a bombing campaign by the United States along the Vietnam–Cambodia border and inside Cambodian territory. However Peter Rodman claimed, "Prince Sihanouk complained bitterly to us about these North Vietnamese bases in his country and invited us to attack them". In December 1967 Washington Post journalist Stanley Karnow was told by Sihanouk that if the US wanted to bomb the Vietnamese communist sanctuaries, he would not object, unless Cambodians were killed. The same message was conveyed to US President Johnson's emissary Chester Bowles in January 1968. So the US had no real motivation to overthrow Sihanouk. However Prince Sihanouk wanted Cambodia to stay out of the North Vietnam–South Vietnam conflict and was very critical of the United States government and its allies (the South Vietnamese government). Prince Sihanouk, facing internal struggles of his own, due to the rise of the Khmer Rouge, did not want Cambodia to be involved in the conflict. Sihanouk wanted the United States and its allies (South Vietnam) to keep the war away from the Cambodian border. Sihanouk did not allow the United States to use Cambodian air space and airports for military purposes. This upset the United States greatly and contributed to their view that of Prince Sihanouk as a North Vietnamese sympathiser and a thorn on the United States. However, declassified documents indicate that, as late as March 1970, the Nixon administration was hoping to garner "friendly relations" with Sihanouk. Throughout the 1960s, domestic Cambodian politics became polarised. Opposition to the government grew within the middle class and leftists including Paris-educated leaders like Son Sen, Ieng Sary, and Saloth Sar (later known as Pol Pot), who led an insurgency under the clandestine Communist Party of Kampuchea (CPK). Sihanouk called these insurgents the Khmer Rouge, literally the "Red Khmer". But the 1966 national assembly elections showed a significant swing to the right, and General Lon Nol formed a new government, which lasted until 1967. During 1968 and 1969, the insurgency worsened. However members of the government and army, who resented Sihanouk's ruling style as well as his tilt away from the United States, did have a motivation to overthrow him. Map of Asia in 1890 CE. While visiting Beijing in 1970 Sihanouk was ousted by a military coup led by Prime Minister General Lon Nol and Prince Sisowath Sirik Matak in the early hours of 18 March 1970. However, as early as 12 March 1970, the CIA Station Chief told Washington that based on communications from Sirik Matak, Lon Nol's cousin, that "the (Cambodian) army was ready for a coup". Lon Nol assumed power after the military coup and immediately allied Cambodia with the United States. Son Ngoc Thanh, an opponent of Pol Pot, announced his support for the new government. 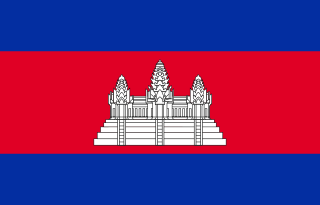 On 9 October, the Cambodian monarchy was abolished, and the country was renamed the Khmer Republic. The new regime immediately demanded that the Vietnamese communists leave Cambodia. Hanoi rejected the new republic's request for the withdrawal of NVA troops. In response, the United States moved to provide material assistance to the new government's armed forces, which were engaged against both CPK insurgents and NVA forces. 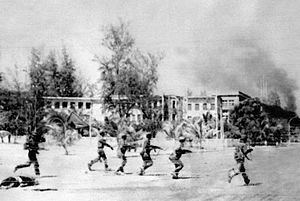 The North Vietnamese and Viet Cong forces, desperate to retain their sanctuaries and supply lines from North Vietnam, immediately launched armed attacks on the new government. The North Vietnamese quickly overran large parts of eastern Cambodia, reaching to within 15 miles (24 km) of Phnom Penh. The North Vietnamese turned the newly won territories over to the Khmer Rouge. The king urged his followers to help in overthrowing this government, hastening the onset of civil war. In April 1970, US President Richard Nixon announced to the American public that US and South Vietnamese ground forces had entered Cambodia in a campaign aimed at destroying NVA base areas in Cambodia (see Cambodian Incursion). The US had already been bombing Vietnamese positions in Cambodia for well over a year by that point. Although a considerable quantity of equipment was seized or destroyed by US and South Vietnamese forces, containment of North Vietnamese forces proved elusive. The government made three unsuccessful attempts to enter into negotiations with the insurgents, but by 1974, the CPK was operating openly as divisions, and some of the NVA combat forces had moved into South Vietnam. Lon Nol's control was reduced to small enclaves around the cities and main transportation routes. More than two million refugees from the war lived in Phnom Penh and other cities. On New Year's Day 1975, Communist troops launched an offensive which, in 117 days of the hardest fighting of the war, caused the collapse of the Khmer Republic. Simultaneous attacks around the perimeter of Phnom Penh pinned down Republican forces, while other CPK units overran fire bases controlling the vital lower Mekong resupply route. A US-funded airlift of ammunition and rice ended when Congress refused additional aid for Cambodia. The Lon Nol government in Phnom Penh surrendered on 17 April 1975, just five days after the US mission evacuated Cambodia. The relationship between the massive carpet bombing of Cambodia by the United States and the growth of the Khmer Rouge, in terms of recruitment and popular support, has been a matter of interest to historians. Some historians have cited the US intervention and bombing campaign (spanning 1965–1973) as a significant factor leading to increased support of the Khmer Rouge among the Cambodian peasantry. However, Pol Pot biographer David Chandler argues that the bombing "had the effect the Americans wanted – it broke the Communist encirclement of Phnom Penh". Peter Rodman and Michael Lind claimed that the US intervention saved Cambodia from collapse in 1970 and 1973. Craig Etcheson agreed that it was "untenable" to assert that US intervention caused the Khmer Rouge victory while acknowledging that it may have played a small role in boosting recruitment for the insurgents. William Shawcross, however, wrote that the US bombing and ground incursion plunged Cambodia into the chaos Sihanouk had worked for years to avoid. The new government sought to completely restructure Cambodian society. Remnants of the old society were abolished and religion was suppressed. Agriculture was collectivised, and the surviving part of the industrial base was abandoned or placed under state control. Cambodia had neither a currency nor a banking system. In December 1978, Vietnam announced the formation of the Kampuchean United Front for National Salvation (KUFNS) under Heng Samrin, a former DK division commander. It was composed of Khmer Communists who had remained in Vietnam after 1975 and officials from the eastern sector—like Heng Samrin and Hun Sen—who had fled to Vietnam from Cambodia in 1978. In late December 1978, Vietnamese forces launched a full invasion of Cambodia, capturing Phnom Penh on 7 January 1979 and driving the remnants of Democratic Kampuchea's army westward toward Thailand. Prince Sihanouk resigned as head of state on 4 April. On 14 April, after its first session, the PRA announced that Khieu Samphan would chair the State Presidium for a 5-year term. It also picked a 15-member cabinet headed by Pol Pot as prime minister. Prince Sihanouk was put under virtual house arrest. 20,000 people died of exhaustion or disease during the evacuation of Phnom Penh and its aftermath. Many of those forced to evacuate the cities were resettled in newly created villages, which lacked food, agricultural implements, and medical care. Many who lived in cities had lost the skills necessary for survival in an agrarian environment. Thousands starved before the first harvest. Hunger and malnutrition—bordering on starvation—were constant during those years. Most military and civilian leaders of the former regime who failed to disguise their pasts were executed. Some of the ethnicities in Cambodia, such as the Cham and Vietnamese, suffered specific and targeted and violent persecutions, to the point of some international sources referring to it as the "Cham genocide". Entire families and towns were targeted and attacked with the goal of significantly diminishing their numbers and eventually eliminated them. Life in 'Democratic Kampuchea' was strict and brutal. In many areas of the country people were rounded up and executed for speaking a foreign language, wearing glasses, scavenging for food, absent for government assigned work, and even crying for dead loved ones. Former businessmen and bureaucrats were hunted down and killed along with their entire families; the Khmer Rouge feared that they held beliefs that could lead them to oppose their regime. A few Khmer Rouge loyalists were even killed for failing to find enough 'counter-revolutionaries' to execute. Religious institutions were not spared by the Khmer Rouge as well, in fact religion was so viciously persecuted to such a terrifying extent that the vast majority of Cambodia's historic architecture, 95% of Cambodia's Buddhist temples, was completely destroyed. The Yale Cambodian Genocide Project estimates approximately 1.7 million. R. J. Rummel, an analyst of historical political killings, gives a figure of 2 million. Emblem of the Salvation Front at the former head office in Phnom Penh. 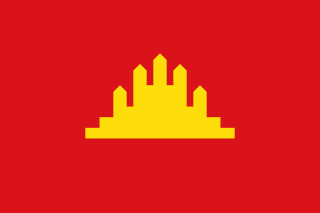 On 10 January 1979, after the Vietnamese army and the KUFNS (Kampuchean United Front for National Salvation) invaded Cambodia and overthrowing the Khmer Rouge, the new People's Republic of Kampuchea (PRK) was established with Heng Samrin as head of state. Pol Pot's Khmer Rouge forces retreated rapidly to the jungles near the Thai border. The Khmer Rouge and the PRK began a costly struggle that played into the hands of the larger powers China, the United States and the Soviet Union. 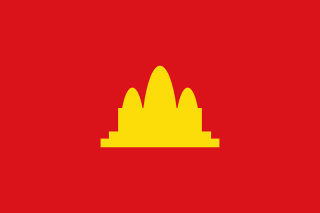 The Khmer People’s Revolutionary Party’s rule gave rise to a guerrilla movement of three major resistance groups – the FUNCINPEC (Front Uni National pour un Cambodge Indépendant, Neutre, Pacifique, et Coopératif), the KPLNF (Khmer People’s National Liberation Front) and the PDK (Party of Democratic Kampuchea, the Khmer Rouge under the nominal presidency of Khieu Samphan). "All held dissenting perceptions concerning the purposes and modalities of Cambodia’s future". Civil war displaced 600,000 Cambodians, who fled to refugee camps along the border to Thailand and tens of thousands of people were murdered throughout the country. Peace efforts began in Paris in 1989 under the State of Cambodia, culminating two years later in October 1991 in a comprehensive peace settlement. The United Nations was given a mandate to enforce a ceasefire and deal with refugees and disarmament known as the United Nations Transitional Authority in Cambodia (UNTAC). On 23 October 1991, the Paris Conference reconvened to sign a comprehensive settlement giving the UN full authority to supervise a cease-fire, repatriate the displaced Khmer along the border with Thailand, disarm and demobilise the factional armies, and prepare the country for free and fair elections. Prince Sihanouk, President of the Supreme National Council of Cambodia (SNC), and other members of the SNC returned to Phnom Penh in November 1991, to begin the resettlement process in Cambodia. The UN Advance Mission for Cambodia (UNAMIC) was deployed at the same time to maintain liaison among the factions and begin demining operations to expedite the repatriation of approximately 370,000 Cambodians from Thailand. On 16 March 1992, the UN Transitional Authority in Cambodia (UNTAC) arrived in Cambodia to begin implementation of the UN settlement plan and to become operational on 15 March 1992 under Yasushi Akashi, the Special Representative of the U.N. Secretary General. UNTAC grew into a 22,000-strong civilian and military peacekeeping force tasked to ensure the conduct of free and fair elections for a constituent assembly. Over 4 million Cambodians (about 90% of eligible voters) participated in the May 1993 elections. Pre-election violence and intimidation was widespread, caused by SOC (State of Cambodia – made up largely of former PDK cadre) security forces, mostly against the FUNCINPEC and BLDP parties according to UNTAC. The Khmer Rouge or Party of Democratic Kampuchea (PDK), whose forces were never actually disarmed or demobilized blocked local access to polling places. Prince Ranariddh's (son of Norodom Sihanouk) royalist Funcinpec Party was the top vote recipient with 45.5% of the vote, followed by Hun Sen's Cambodian People's Party and the Buddhist Liberal Democratic Party, respectively. Funcinpec then entered into a coalition with the other parties that had participated in the election. A coalition government resulted between the Cambodian People’s Party and FUNCINPEC, with two co-prime ministers – Hun Sen, since 1985 the prime minister in the Communist government, and Norodom Ranariddh. The parties represented in the 120-member assembly proceeded to draft and approve a new constitution, which was promulgated 24 September 1993. It established a multiparty liberal democracy in the framework of a constitutional monarchy, with the former Prince Sihanouk elevated to King. Prince Ranariddh and Hun Sen became First and Second Prime Ministers, respectively, in the Royal Cambodian Government (RGC). The constitution provides for a wide range of internationally recognised human rights. On 4 October 2004, the Cambodian National Assembly ratified an agreement with the United Nations on the establishment of a tribunal to try senior leaders responsible for the atrocities committed by the Khmer Rouge. International donor countries have pledged a US$43 Million share of the three-year tribunal budget as Cambodia contributes US$13.3 Million. The tribunal has sentenced several senior Khmer Rouge leaders since 2008. Cambodia is still infested with countless land mines, indiscriminately planted by all warring parties during the decades of war and upheaval. ^ Chandler, David (July 2009). "Cambodian History: Searching for the Truth". Cambodia Tribunal Monitor. Northwestern Primary School of Law Center for International Human Rights and Documentation Center of Cambodia. Retrieved 25 November 2015. We have evidence of cave dwellers in northwestern Cambodia living as long ago as 5000 BCE. ^ Mourer, Cécile; Mourer, Roland (July 1970). "The Prehistoric Industry of Laang Spean, Province of Battambang, Cambodia". Archaeology & Physical Anthropology in Oceania. Oceania Publications, University of Sydney. 5 (2): 128–146. JSTOR 40386114. ^ ""What and Where was Chenla? ", Recherches nouvelles sur le Cambodge" (PDF). Michael Vickery’s Publications. Retrieved 5 July 2015. ^ "The emergence and ultimate decline of the Khmer Empire - Many scholars attribute the halt of the development of Angkor to the rise of Theravada...p.14" (PDF). Studies Of Asia. Retrieved 24 July 2016. ^ "AN EIGHTEENTH CENTURY INSCRIPTION FROM ANGKOR WAT by David P. Chandler" (PDF). The Siam Society. Retrieved 29 June 2015. ^ "Kingdom of Cambodia – 1431–1863". GlobalSecurity. Retrieved 12 June 2015. ^ a b Ross Marlay; Clark D. Neher (1999). Patriots and Tyrants: Ten Asian Leaders. Rowman & Littlefield. p. 147. ISBN 978-0-8476-8442-7. ^ "Murder and Mayhem in Seventeenth Century Cambodia". Institute of Historical Research (IHR). Retrieved 26 June 2015. ^ "Maritime Trade in Southeast Asia during the Early Colonial Period ...transferring the lucrative China trade to Cambodia..." (PDF). Oxford Centre for Maritime Archaeology University of Oxford. Retrieved 26 June 2015. ^ Ben Kiernan (2008). Blood and Soil: Modern Genocide 1500-2000. Melbourne Univ. Publishing. ISBN 978-0-522-85477-0. ^ "1551 – WAR WITH LOVEK – During the Burmese siege of Ayutthaya in 1549 the King of Cambodia, Ang Chan..." History of Ayutthaya. Retrieved 26 June 2015. ^ Nicholas Tarling (1999). The Cambridge History of Southeast Asia. Cambridge University Press. p. 100. ISBN 978-0-521-66370-0. ^ "Reconceptualizing Southern Vietnamese History from the 15th to 18th Centuries Competition along the Coasts from Guangdong to Cambodia by Brian A. Zottoli". University of Michigan. Retrieved 26 June 2015. ^ Smithies, Michael (8 March 2010). "The great Lao buffer zone". The Nation. Archived from the original on 2 April 2015. Retrieved 3 April 2015. ^ LePoer, Barbara Leitch, ed. (1987). "The Crisis of 1893". Thailand: A Country Study. Library of Congress. Retrieved 3 April 2015. ^ "Cambodia became a peripheral area, widely uncared for by France as economic benefits from Cambodia were negligible" (PDF). Max-Planck-Institut. Retrieved 26 November 2015. ^ "CAMBODIA'S BORDER WITH ENGAGEMENT FROM POWER COUNTRIES by SORIN SOK, Research Fellow – The treaty of 1863" (PDF). Cambodian Institute for Cooperation and Peace. Retrieved 7 July 2015. ^ Marie Alexandrine Martin (1994). Cambodia: A Shattered Society. University of California Press. p. 31. ISBN 978-0-520-07052-3. ^ "COMMUNISM AND CAMBODIA – Cambodia first declared independence from the French while occupied by the Japanese. Sihanouk, then King, made the declaration on 12 March 1945, three days after Hirohito's Imperial Army seized and disarmed wavering French garrisons throughout Indo-China" (PDF). DIRECTORATE OF INTELLIGENCE. Retrieved 7 July 2015. ^ "Simulation on The Cambodia Peace Settlement – The Sihanouk Era – The government of the new kingdom initially took a neutral stance in order to protect itself from neighboring countries". UNITED STATES INSTITUTE OF PEACE. Retrieved 7 July 2015. ^ "Conflict in Cambodia, 1945–2002 by Ben Kiernan – American aircraft dropped over half a million tons of bombs on Cambodia's countryside, killing over 100.000 peasants..." (PDF). Yale University. Retrieved 7 July 2015. ^ "Cambodia – History". Sandbox Networks, Inc. Retrieved 6 June 2016. ^ Joachim Schliesinger (2015). Ethnic Groups of Cambodia Vol 1: Introduction and Overview. Booksmango. p. 1. ISBN 978-1-63323-232-7. ^ David Chandler, A History of Cambodia (Westview Publishers: Boulder Colorado, 2008) p. 13. ^ Forestier, Hubert; Sophady, Heng; Puaud, Simon; Celiberti, Vincenzo; Frère, Stéphane; Zeitoun, Valéry; Mourer-Chauviré, Cécile; Mourer, Roland; Than, Heng; Billault, Laurence (2015). "The Hoabinhian from Laang Spean Cave in its stratigraphic, chronological, typo-technological and environmental context (Cambodia, Battambang province)". Journal of Archaeological Science: Reports. 3: 194–206. doi:10.1016/j.jasrep.2015.06.008. ^ "Human origin sites and the World Heritage Convention in Asia – The case of Phnom Teak Treang and Laang Spean cave, Cambodia: The potential for World Heritage site nomination; the significance of the site for human evolution in Asia, and the need for international cooperation" (PDF). World Heritage. Retrieved 8 July 2015. ^ "Circular Earthwork Krek 52/62: Recent Research on the Prehistory of Cambodia" (PDF). Project MUSE. Retrieved 7 July 2015. ^ "Bioarchaeological evidence for conflict in Iron Age north-west Cambodia - Examination of skeletal material from graves at Phum Snay in north-west Cambodia revealed an exceptionally high number of injuries..." Cambridge University Press. 2 January 2015. Retrieved 8 July 2015. ^ "Art and Archaeology of Fu-Nan" (PDF). Department of Anthropology College of Social Sciences University of Hawaii. Retrieved 7 July 2015. ^ "Trade and Exchange Networks in Iron Age Cambodia: Preliminary Results from a Compositional Analysis of Glass Beads - Beads made of glass and stone found at Iron Age period sites (500 BCE – 500 CE) in Southeast Asia are amongst the first signs for sustained trade and sociopolitical contact with South Asia..." Indo-Pacific Prehistory Association. Retrieved 7 July 2015. ^ "THE VIRTUAL MUSEUM OF KHMER ART - History of Funan - The Liang Shu account from Chinese Empirical Records". Wintermeier collection. Retrieved 13 July 2015. ^ "Southeast Asian Riverine and Island Empires by Candice Goucher, Charles LeGuin, and Linda Walton - Funan rulers of the early first century legitimized their rule on the basis of claimed descent from heroic ancestors" (PDF). The Annenberg Foundation. Retrieved 13 July 2015. ^ "Pre-Angkorian and Angkorian Cambodia by Miriam T. Stark - Chinese documentary evidence described walled and moated cities..." (PDF). Khamkoo. Retrieved 13 July 2015. ^ "Southeast Asian Riverine and Island Empires by Candice Goucher, Charles LeGuin, and Linda Walton - Early Funan was composed of a number of communities..." (PDF). Retrieved 13 July 2015. ^ "Khmer Ceramics by Dawn Rooney – The language of Funan was..." (PDF). Oxford University Press 1984. Retrieved 13 July 2015. ^ Gernet, Jacques (1996). A History of Chinese Civilization. Cambridge University Press. pp. 126–127, 196–197. ISBN 978-0-521-49781-7. ^ "Funan Kingdom - 100-545 CE - In the mid-3rd century A.D. two chinese traders, Kang Tai and Zhu Ying, visited Vyadharapura". Global Security. Retrieved 13 July 2015. ^ "Encyclopedia of Ancient Asian Civilizations by Charles F. W. Higham – the inscriptions, written in Sanskrit and employing the Indian Brahmi script, record the presence of kings and queens who took Indian names and founded temples dedicated to Indian gods" (PDF). Library of Congress. Retrieved 13 July 2015. ^ "Khmer Ceramics by Dawn Rooney – Funan became an important centre because it controlled strategic land routes in addition to coastal areas" (PDF). Oxford University Press 1984. Retrieved 13 July 2015. ^ "Pre-Angkorian and Angkorian Cambodia by Miriam T. Stark – ...economic and administrative hub" (PDF). Khamkoo. Retrieved 13 July 2015. ^ "The "Indianization" of Funan: An Economic History of Southeast Asia's First State by Kenneth R. Hall – providing suitable stopping places for sailors and traders; available to them were food, water, and shelter as well as storage facilities and market places for exchange..." Kenneth R. Hall. Retrieved 13 July 2015. ^ "Funan Kingdom – 100–545 CE The remains of what is believed to have been the kingdom's main port, Oc Eo (now part of Vietnam), contain Roman as well as Persian, Indian, and Greek artefacts". Global Security. Retrieved 13 July 2015. ^ "9 Textualized Places, Pre-Angkorian Khmers and Historicized Archaeology by Miriam T. Stark – Cambodia's Origins and the Khok Thlok Story" (PDF). University of Hawaii. Retrieved 13 July 2015. ^ "Funan Reviewed : Deconstructing the Ancients In: Bulletin de l'Ecole française d'Extrême-Orient. Tome 90–91, 2003. pp. 101–143. – In that case the place from which the stranger started his voyage to Funan would have been on the east coast of the Malay peninsula" (PDF). Michael Vickery’s Publications. Retrieved 13 July 2015. ^ "Kalinga and Funan : A Study in Ancient Relations – there is considerable disagreement on the homeland of Kaundinya" (PDF). Government of Odisha. Archived from the original (PDF) on 13 July 2015. Retrieved 13 July 2015. ^ "Funan Reviewed : Deconstructing the Ancients In: Bulletin de l'Ecole française d'Extrême-Orient. Tome 90–91, 2003. pp. 101–143. – Altogether there are 4 versions differing among themselves in interesting ways. – The first version..." (PDF). Michael Vickery’s Publications. Retrieved 13 July 2015. ^ "Kalinga and Funan: A Study in Ancient Relations – This Chinese version of the dynastic origin of Funan has been corroborated by a Sanskrit inscription of Champa belonging to the third century CE" (PDF). Government of Odisha. Archived from the original (PDF) on 13 July 2015. Retrieved 13 July 2015. ^ "Southeast Asian Riverine and Island Empires by Candice Goucher, Charles LeGuin, and Linda Walton – The mythical account of the founding of Funan reflects in symbolic terms the conditions..." (PDF). The Annenberg Foundation. Retrieved 13 July 2015. ^ "Funan Reviewed : Deconstructing the Ancients In: Bulletin de l'Ecole française d'Extrême-Orient. Tome 90–91, 2003. pp. 101–143. – there is no evidence that the initial foreign conqueror came from India, neither is it clear that he was a Brahman, and almost certainly his name, as given to the Chinese, was not Kaundinya..." (PDF). Michael Vickery’s Publications. Retrieved 13 July 2015. ^ "Thinking Through Srivijaya: Polycentric Networks in Traditional Southeast Asia By Rosita Dellios and R. James Ferguson – Yet Funan, like Srivijaya, was not a straightforward country/state or "guo" in the Western or Chinese sense. Funan has been shown to be "a conglomerate of chiefdoms but not a state"" (PDF). Bond University Australia. Retrieved 13 July 2015. ^ "Funan Reviewed : Deconstructing the Ancients In: Bulletin de l'Ecole française d'Extrême-Orient. Tome 90–91, 2003. pp. 101–143. – What was Funan? Nevertheless, it is a priori unlikely that..." (PDF). 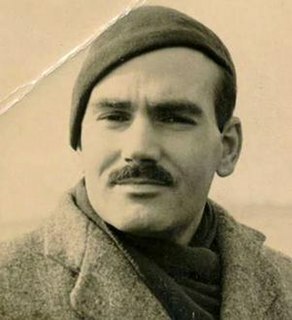 Michael Vickery. Retrieved 13 July 2015. ^ "A Short History of South East Asia Chapter 1. Early Movements of PeopIes, Indian Influence – The First States on the Mainland Cambodia (Funan) – Vassal kingdoms spread to southern Vietnam in the east and to the Malay peninsula in the west" (PDF). Stanford University. Retrieved 13 July 2015. ^ "Southeast Asian Riverine and Island Empires by Candice Goucher, Charles LeGuin, and Linda Walton – Here we will look at two empires" (PDF). The Annenberg Foundation. Retrieved 13 July 2015. ^ "ANCIENT CIVILIZATIONS IN SOUTHEAST ASIA: FUNAN, SRIVIJAYA AND THE MON". Facts and Details. Retrieved 13 July 2015. ^ "Southeast Asian Riverine and Island Empires by Candice Goucher, Charles LeGuin, and Linda Walton - By the end of the fifth century, international trade through" (PDF). The Annenberg Foundation. Retrieved 13 July 2015. ^ Stark, Miriam T. (1998). "The Transition to History in the Mekong by Miriam T. Stark - There is another untapped role for archaeological approaches to the early historic period...". International Journal of Historical Archaeology. 2 (3): 175–203. doi:10.1023/A:1027368225043. ^ "Encyclopedia of Ancient Asian Civilizations by Charles F. W. Higham - Chenla - Chinese histories record that a state called Chenla..." (PDF). Library of Congress. Retrieved 13 July 2015. ^ ""What and Where was Chenla?" - In the 1970s Claude Jacques began cautiously to move away from the established historiographical framework" (PDF). Michael Vickery. Retrieved 15 July 2015. ^ ""What and Where was Chenla?" - there is really no need to look for Chenla beyond the borders of what is present-day Cambodia. All that is required is that it be inland from Funan" (PDF). Michael Vickery publications. Retrieved 14 July 2015. ^ "THE JOURNAL OF THE SIAM SOCIETY - AN HISTORICAL ATLAS OF THAILAND Vol. LII Part 1-2 1964 - The Australian National University Canberra" (PDF). The Australian National University. Retrieved 15 July 2015. ^ a b "Chenla – 550–800". Global Security. Retrieved 13 July 2015. ^ "The Kingdom of Chenla". Asia's World. Archived from the original on 14 July 2015. Retrieved 13 July 2015. ^ Jacques Dumarçay; Pascal Royère (2001). Cambodian Architecture: Eighth to Thirteenth Centuries. BRILL. p. 109. ISBN 978-90-04-11346-6. ^ "The water management network of Angkor, Cambodia Roland Fletcher Dan Penny, Damián Evans, Christophe Pottier, Mike Barbetti, Matti Kummu, Terry Lustig & Authority for the Protection and Management of Angkor and the Region of Siem Reap (APSARA) Department of Monuments and Archaeology Team" (PDF). University of Washington. Retrieved 14 July 2015. ^ "The emergence and ultimate decline of the Khmer Empire – Many scholars attribute the halt of the development of Angkor to the rise of Theravada..." (PDF). Studies Of Asia. Retrieved 11 June 2015. ^ "The Descendants of Kambu: The Political Imagination of Angkorian Cambodia By Ian Nathaniel Lowman" (PDF). University of California, Berkeley. Retrieved 14 July 2015. ^ "GEOHYDROLOGY AND THE DECLINE OF ANGKOR by HENG L. THUNG" (PDF). Khamkoo. Retrieved 29 June 2015. ^ "Historie routes to Angkor: development of the Khmer road system (ninth to thirteenth centuries CE) in mainland Southeast Asia by Mitch Hendrickson" (PDF). University of Sydney. Retrieved 14 July 2015. ^ "Zhou Daguan-A Record of Cambodia-Siam Society Review by Milton Osborne". The Great Khmer Empire. Retrieved 13 July 2015. ^ "The emergence and ultimate decline of the Khmer Empire was paralleled with development and subsequent change in religious ideology, together with infrastructure that supported agriculture by Kay McCullough" (PDF). National Academy of Science. Retrieved 15 July 2015. ^ David G. Marr, Anthony Crothers Milner (1986). Southeast Asia in the 9th to 14th Centuries. Institute of Southeast Asian Studies, Singapore. p. 244. ISBN 978-9971-988-39-5. ^ "Murder and Mayhem in Seventeenth Century Cambodia – The so-called middle period of Cambodian history, stretching from... – Reviews in History". School of Advanced Study at the University of London. 28 February 2009. Retrieved 14 June 2015. ^ "What the collapse of ancient capitals can teach us about the cities of today by Srinath Perur – There had long been a debate about what led to the decline of Angkor and the southward move of the Khmer..." The Guardian. 14 January 2015. Retrieved 27 June 2015. ^ "Cambodia and Its Neighbors in the 15th Century, Michael Vickery". Michael Vickery’s Publications. 1 June 2004. Retrieved 8 June 2015. ^ "Scientists dig and fly over Angkor in search of answers to golden city's fall by Miranda Leitsinger". The San Diego Union-Tribune. 13 June 2004. Retrieved 19 June 2015. ^ "What Caused the End of the Khmer Empire By K. Kris Hirst". About com. Retrieved 11 June 2015. ^ "THE DECLINE OF ANGKOR". Encyclopædia Britannica, Inc. Retrieved 11 June 2015. ^ "The emergence and ultimate decline of the Khmer Empire was paralleled with development and subsequent change in religious ideology, together with infrastructure that supported agriculture" (PDF). Studies Of Asia. Retrieved 11 June 2015. ^ "Laser scans flesh out the saga of Cambodias 1200 year old lost city". KHMER GEO. Archived from the original on 14 June 2015. Retrieved 11 June 2015. ^ "Possible new explanation found for sudden demise of Khmer Empire". Phys org. 3 January 2012. Retrieved 11 June 2015. ^ "The emergence and ultimate decline of the Khmer Empire – ...the Empire experienced two lengthy droughts, during c.1340–1370 and also c.1400–1425..." (PDF). Studies of Asia. Retrieved 19 June 2015. ^ Buckley, B. M.; Anchukaitis, K. J.; Penny, D.; Fletcher, R.; Cook, E. R.; Sano, M.; Nam, L. C.; Wichienkeeo, A.; Minh, T. T.; Hong, T. M. (2010). "Climate as a contributing factor in the demise of Angkor, Cambodia". Proceedings of the National Academy of Sciences. 107 (15): 6748–6752. doi:10.1073/pnas.0910827107. PMC 2872380. PMID 20351244. ^ "Mak Phœun : Histoire du Cambodge de la fin du XVIe au début du XVIIIe siècle" (PDF). Michael Vickery. Retrieved 11 June 2015. ^ "The Ming Shi-lu as a Source for the Study of Southeast Asian History". Southeast Asia in the Ming Shi-lu. Archived from the original on 22 June 2015. Retrieved 12 June 2015. ^ "The Ming Shi-lu as a source for Southeast Asian History by Geoff Wade, Asia Research Institute, National University of Singapore 2.5 CHARACTERISTICS OF THE MSL AS A HISTORICAL SOURCE" (PDF). National University of Singapore. Archived from the original (PDF) on 1 July 2015. Retrieved 11 June 2015. ^ "THE ABRIDGED ROYAL CHRONICLE OF AYUDHYA" (PDF). The Siam Society. Retrieved 12 June 2015. ^ "The Descendants of Kambu: The Political Imagination of Angkorian Cambodia by Ian Nathaniel Lowman". University of California, Berkeley Digital Assets. Retrieved 27 June 2015. ^ "Giovanni Filippo de MARINI, Delle Missioni… CHAPTER VII – MISSION OF THE KINGDOM OF CAMBODIA by Cesare Polenghi – It is considered one of the most renowned for trading opportunities: there is abundance..." (PDF). The Siam Society. Retrieved 1 July 2015. ^ Anthony Reid (2000). Charting the Shape of Early Modern Southeast Asia. Silkworm Books. p. 10. ISBN 978-1-63041-481-8. ^ "Maritime Trade in Southeast Asia during the Early Colonial Period" (PDF). University of Oxford. Retrieved 12 June 2015. ^ Peter Church (2012). A Short History of South-East Asia. John Wiley & Sons. p. 24. ISBN 978-1-118-35044-7. ^ Cathal J. Nolan (2002). The Greenwood Encyclopedia of International Relations: S-Z. Greenwood Publishing Group. p. 1653. ISBN 978-0-313-32383-6. ^ Keat Gin Ooi (2004). Southeast Asia: A Historical Encyclopedia, from Angkor Wat to East Timor. ABC-CLIO. p. 566. ISBN 978-1-57607-770-2. ^ "London Company's Envoys Plot Siam" (PDF). Siamese Heritage. Retrieved 7 May 2015. ^ Norman G. Owen (2005). The Emergence Of Modern Southeast Asia: A New History. University of Hawaii Press. pp. 117–. ISBN 978-0-8248-2890-5. ^ "Colonial Era – Cambodia Enters the Wider World: 1863 – 1953 Cambodian History Searching for the Truth, July 2009 By David Chandler". NORTHWESTERN UNIVERSITY SCHOOL OF LAW CENTER FOR INTERNATIONAL HUMAN RIGHTS AND DOCUMENTATION CENTER OF CAMBODIA. Retrieved 25 November 2015. ^ Philip Short, Pol Pot: Anatomy of a Nightmare p. 197. ^ "Prince Sihanouk was deposed in a right-wing coup in 1970 led by Lt-Gen Lon Nol"
^ Philip Short, Pol Pot: Anatomy of a Nightmare (Henry Holt & Co.: New York, 2004) p. 195. ^ Sihanouk, Norodom (1973). My War with the CIA: The Memoirs of Prince Norodom Sihanouk as Related to Wilfred Burchett. Pantheon Books. ISBN 978-0394485430. ^ Philip Short, Pol Pot: Anatomy of a Nightmare (Henry Holt & Co.: New York, 2004) p. 204. ^ Philip Short, Pol Pot: Anatomy of a Nightmare p. 4. ^ Rodman, Peter, Returning to Cambodia Archived 10 November 2011 at the Wayback Machine, Brookings Institution, 23 August 2007. ^ Shawcross, William, Sideshow, Isaacs, Hardy, & Brown, pp. 92–100, 106–112. ^ Dmitry Mosyakov, "The Khmer Rouge and the Vietnamese Communists: A History of Their Relations as Told in the Soviet Archives" Archived 9 March 2013 at the Wayback Machine, in Susan E. Cook, ed., Genocide in Cambodia and Rwanda (Yale Genocide Studies Program Monograph Series No. 1, 2004), p. 54ff. "In April–May 1970, many North Vietnamese forces entered Cambodia in response to the call for help addressed to Vietnam not by Pol Pot, but by his deputy Nuon Chea. Nguyen Co Thach recalls: 'Nuon Chea has asked for help and we have liberated five provinces of Cambodia in ten days.'" ^ Shawcross, William and Peter Rodman, Defeat's Killing Fields, Brookings Institution, 7 June 2007. ^ The Economist, 26 February 1983; The Washington Post, 23 April 1985. ^ Bezlova, Antoaneta, China haunted by Khmer Rouge links, Asia Times, 21 February 2009. ^ Philip Short (25 April 2013). Pol Pot: The History of a Nightmare. p. 435. ISBN 9781444780307. ^ Kevin Baker (3 November 2014). The Worst World Disasters of All Time. p. 23. ISBN 9781456623432. ^ a b Sharp, Bruce (1 April 2005). "Counting Hell: The Death Toll of the Khmer Rouge Regime in Cambodia". Retrieved 5 July 2006. ^ "Cambodian Genocide Program | Yale University". Yale.edu. 18 July 2007. Retrieved 27 July 2010. ^ "Rummel, RJ, "Statistics of Cambodian Democide: Estimates, Calculations, And Sources"". Hawaii.edu. Retrieved 27 July 2010. ^ William Shawcross, The Quality of Mercy: Cambodia, Holocaust, and Modern Conscience (Touchstone, 1985), pp. 115–6. ^ Heuveline, Patrick (2001). "The Demographic Analysis of Mortality in Cambodia". In Forced Migration and Mortality, eds. Holly E. Reed and Charles B. Keely. Washington, D.C.: National Academy Press. ^ "Vietnam's invasion of Cambodia and the PRK's rule constituted a challenge on both the national and international political level. On the national level, the Khmer People's Revolutionary Party's rule gave rise..." (PDF). Max-Planck-Institut. Retrieved 26 November 2015. ^ Craig Etcheson, After the Killing Fields (Praeger, 2005), pp24, 27. ^ US Department of State. Country Profile of Cambodia.. Retrieved 26 July 2006. ^ Nassrine De Rham-Azimi (1995). The United Nations Transitional Authority in Cambodia (Untac: Debriefing and Lessons : Report and Recommendations of the International Conference, Singapore, August 1994. Martinus Nijhoff Publishers. p. 68. ISBN 978-90-411-0886-9. ^ "Historical background, International Conference on Kampuchea, Paris Conference, Intense diplomatic activity, P-5 proposal, Ceasefire UNAMIC DEPLOYED Establishment, Expansion of mandate, Ceasefire violations". United Nations. Retrieved 26 November 2015. ^ "OPINION: The 1991 Paris Peace Agreement Had Been the Starting Point in the Quest for Peace, Independence, Sovereignty and Territorial Integrity". AKP. 23 October 2014. Retrieved 26 November 2015. ^ "One Year After the Paris Accords: An Interview with Yasushi Akashi". Phnom Penh Post. 6 November 1992. Retrieved 26 November 2015. ^ "UNTAC was established by Security Council resolution 745 (1992) of 28 February 1992". United Nations. Retrieved 26 November 2015. ^ "UNITED NATIONS TRANSITIONAL AUTHORITY IN CAMBODIA (UNTAC) – Facts and Figures". United Nations. Retrieved 26 November 2015. ^ "CAMBODIA HUMAN RIGHTS PRACTICES, 1993". U.S. DEPARTMENT OF STATE. 31 January 1994. Archived from the original on 9 September 2016. Retrieved 26 November 2015. ^ "CAMBODIA'S ELECTIONS TURN SOUR – Pre-election violence and intimidation" (PDF). International Crisis Group. Archived from the original (PDF) on 4 March 2016. Retrieved 26 November 2015. ^ ""Massive irregularities": SOC charges of Voting Fraud". SEAsite. Retrieved 26 November 2015. ^ "Royal Government of Cambodia [RGC] – The election resulted in a coalition government". GlobalSecurity. Retrieved 26 November 2015. ^ "Constitution of Cambodia" (PDF). OHCHR Cambodia. Archived from the original (PDF) on 4 March 2016. Retrieved 26 November 2015. ^ a b Brad Adams (31 May 2012). "Adams, Brad, 10,000 Days of Hun Sen, International Herald Tribune, reprinted by Human Rights Watch.org". Hrw.org. Retrieved 15 March 2013. ^ "About ECCC – INTRODUCTION". Extraordinary Chambers in the Courts of Cambodia (ECCC). Retrieved 26 November 2015. ^ "Accused Persons – Cambodia Tribunal Monitor". Cambodia Tribunal Monitor. Retrieved 26 November 2015. ^ "Landmines in Cambodia". seasite. Retrieved 26 November 2015. Funan or, , or Nokor Phnom was the name given by Chinese cartographers, geographers and writers to an ancient Indianised state—or, rather a loose network of states (Mandala)—located in mainland Southeast Asia centered on the Mekong Delta that existed from the first to sixth century CE. The name is found in Chinese historical texts describing the kingdom, and the most extensive descriptions are largely based on the report of two Chinese diplomats, Kang Tai and Zhu Ying, representing the Wu Kingdom of Nanking who sojourned in Funan in the mid-3rd century AD. Cambodia, officially the Kingdom of Cambodia, is a country located in the southern portion of the Indochina peninsula in Southeast Asia. It is 181,035 square kilometres in area, bordered by Thailand to the northwest, Laos to the northeast, Vietnam to the east and the Gulf of Thailand to the southwest. The Dark ages of Cambodia, also called the Middle Period, refers to the historical era from the early 15th century to 1863, the beginning of the French Protectorate of Cambodia. As reliable sources are very rare, a defensible and conclusive explanation that relates to concrete events that manifest the decline of the Khmer Empire, recognised unanimously by the scientific community, has so far not been produced. However, most modern historians have approached a consensus in which several distinct and gradual changes of religious, dynastic, administrative and military nature, environmental problems and ecological imbalance coincided with shifts of power in Indochina and must all be taken into account to make an interpretation. In recent years scholars' focus has shifted increasingly towards human–environment interactions and the ecological consequences, including natural disasters, such as flooding and droughts. Chenla or Zhenla is the Chinese designation for the successor polity of the Kingdom of Funan preceding the Khmer Empire that existed from around the late sixth to the early ninth century in Indochina. The name was still used in the 13th century by the Chinese envoy Zhou Daguan, author of The Customs of Cambodia. It appears on the Mao Kun map. However, modern historiography applies the name exclusively to the period from the late 6th to the early ninth century. It is dubious if "Chenla" ever existed as a unitary kingdom or if this is a misconception by Chinese chronists. Most modern historians assert that "Chenla" was in fact just a series of loose and temporary confederations of principalities. The largest of the ethnic groups in Cambodia are the Khmer, who comprise approximately 90% of the total population and primarily inhabit the lowland Mekong subregion and the central plains. The Khmer historically have lived near the lower Mekong River in a contiguous arc that runs from the southern Khorat Plateau where modern-day Thailand, Laos and Cambodia meet in the northeast, stretching southwest through the lands surrounding Tonle Sap lake to the Cardamom Mountains, then continues back southeast to the mouth of the Mekong River in southeastern Vietnam. Michael Theodore Vickery was an American historian, lecturer, and author known for his works about the history of Southeast Asia.